A-11 tool steel is a high vanadium tool steel. This grade possesses wear resistance superior to most other tool steels along with good strength and toughness characteristics. 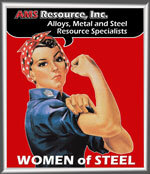 M-42 alloy is a powder metal super-high-speed steel possessing a hardness capability of Rockwell C 68/70. This alloy has been used for cutting tools in the toughest machining operations. The advantages M-42 high speed steels include ease of grinding, response to heat treatment, more uniform structure, greater wear resistance and improved toughness.